I have finally fount a spot here in Thailand this trip that’s not too urban jungle and not too backwater backpacker. There’s a long stretch of beach to run and swim along, rocks to scramble up and a service industry second to none. 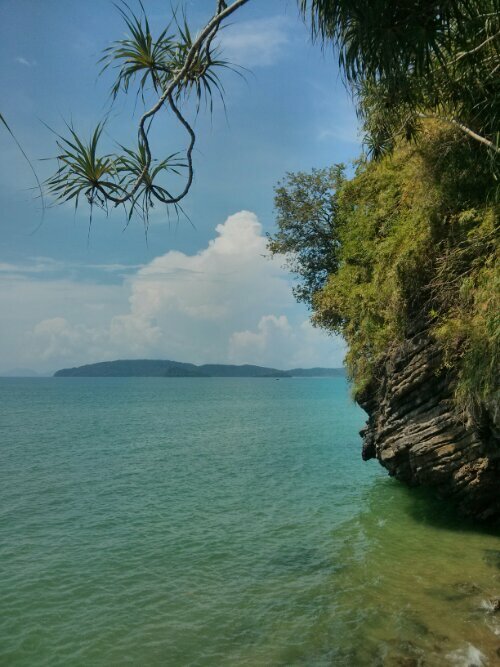 It appears to be low season for tourists here in Ao Nang Bay and I have found a secluded spot to call my own. The sea has been warm and calm, so I have enjoyed swimming out to deeper waters and diving down to the cooling undercurrents. This morning I woke early to avoid the tourist transportation rush in Krabi, Thailand (Ao Nang Bay has boats and buses to numerous islands and overland destinations) and did a spot of easy free climbing. I soon developed a one-man audience and thought it best to give up the overhang manoeuvre that I was never going to do without protection or crash mat! When I get back to more regular Internet access I would like to investigate if anyone has brought the concept of a triathlon training camp to Thailand. In the past I have attended Muay Thai (Thai boxing) training sessions, which have been popular for years. In many of the popular seaside resort locations the water is perfect and there are plenty of options for running both on-road and off-road. Even when the monsoon rains pass through, the water stays calm enough to swim and the temperature drops a few degrees to the mid twenties (celsius). The only question mark would be around road cycling: the standard of driving is a bit more GTA than Driving Miss Daisy, but I reckon that local drivers would give a peleton of riders a wide berth. At any rate, I’m getting a lot more training in that I’d imagined and even the occasional monsoon showers can’t dampen my spirit!